This might not be Neo-Tokyo, but that sure looks like Shotaro Kaneda's bike in cyberpunk anime Akira. Masashi Teshima from Fukuoka, Japan thought he'd like an Akira bike for himself and spent seven years and ¥10 million (US$121,000) to make it. 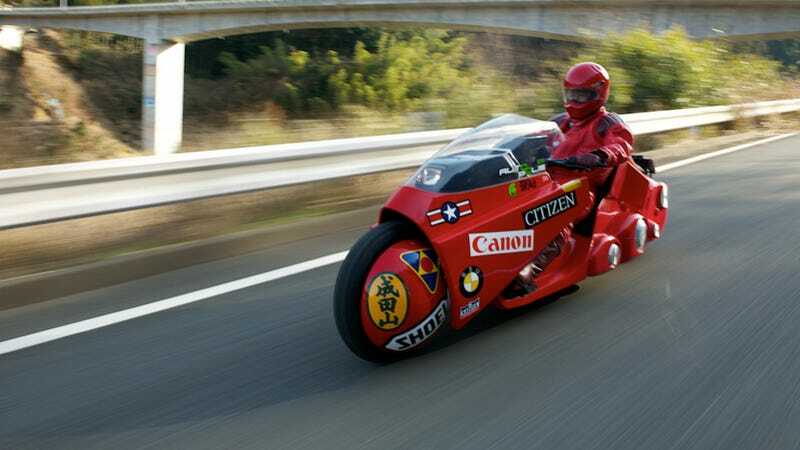 While there are other Kaneda bike projects, this one is officially recognized by Akira creator Katsuhiro Otomo. And Teshima is riding the bike across the country to raise money for children's autism. In the above gallery, you can see Teshima and his custom bike in Fukuoka, Kobe, and Osaka. The last stop is Tokyo, where it will be displayed at an exhibition for Katsuhiro Otomo. Visitors to the exhibit can sit on the bike and have their photos taken with it. The exhibit is for a good cause, too: it's raising money for victims of last year's earthquake. First serialized in 1982 as a manga, Akira was turned into an iconic feature film anime in 1988.